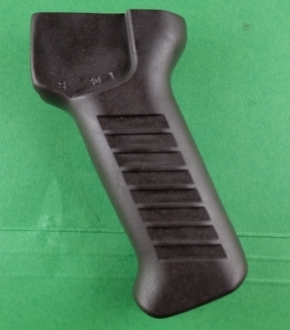 After many requests, we now have our version of the next generation Bulgarian Grip that is used on the AR-M12F, AR-M8F, AR-M4SF, AR-M1F41 and AR-M9 rifles (among others) with the original selector notch! This grip is in our Dark Russian Plum color. It is so dark that in the photos it almost looks black but in direct light, you can see a hint of reddish plum. To give you an idea of the size, this grip feels like a 25% bigger Tantal grip - it is blocky and would be very comfortable for guys who wear at least large size glove. I wear an XL glove. This grip comes with one of our high-strength alloy screws and will have our sure-grip blast matte finish. You can choose the color you would like from the drop down box. This Winter item will ship within two weeks of you ordering it. It is inventoried so we will only list available items if they are done or almost done.